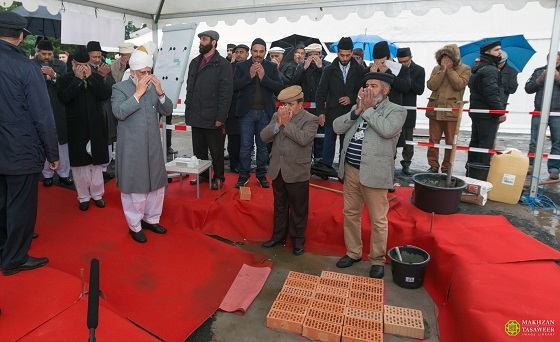 Hazrat Mirza Masroor Ahmad lays foundation stone for Sadiq Mosque in Nordhorn. The Ahmadiyya Muslim Community is pleased to announce that on 14 October 2015, His Holiness, Hazrat Mirza Masroor Ahmad, the World Head of the Ahmadiyya Muslim Community, the Fifth Khalifa (Caliph), laid the foundation stone for the first Ahmadiyya Muslim Mosque in the German city of Nordhorn. His Holiness has named the Mosque the Sadiq Mosque (Mosque of the Truthful). Around 100 guests attended the ceremony, including various dignitaries, such as Mayor of Nordhorn, Thomas Berling and Deputy District Commissioner, Helena Hoon. The formal session began with a welcome address given by Abdullah Wagishauser, the National President of the Ahmadiyya Muslim Community in Germany.He informed the audience that the Ahmadiyya Muslim Community in Nordhorn was providing assistance to the local authorities as they deal with the sudden influx of refugees from Syria. 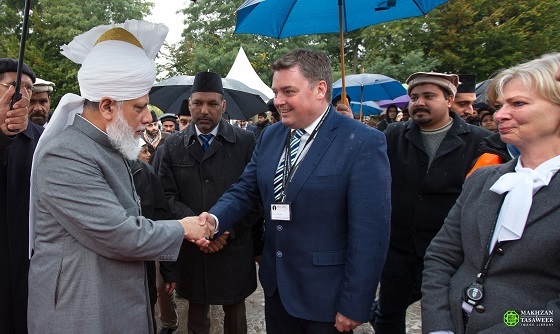 Mayor of Nordhorn, Thomas Berling said: “I am very grateful to the Ahmadiyya Muslim Community for offering to assist us in our efforts to absorb the sudden influx of refugees. You are providing invaluable services, in particular in terms of translation. Every act of the Ahmadiyya Muslim Community is based upon its motto of ‘Love for All, Hatred for None’.”The keynote address was delivered by Hazrat Mirza Masroor Ahmad, who said the Founder of the Ahmadiyya Muslim Community had instructed that it was the duty of Muslims to fulfil both the rights due to God and to humanity. Based on this teaching, His Holiness said the new Mosque would not only be a place to worship the One God, but would also prove a means of serving and protecting all people. The religious leader said that it was the duty of Muslims to love and protect their neighbours. His Holiness said that the fact so many guests were attending the ceremony proved that the local people had extremely high moral standards and sought an inclusive society in which all people were welcome. He said that the local people had “tightly grasped the hand of friendship extended by Ahmadi Muslims”. 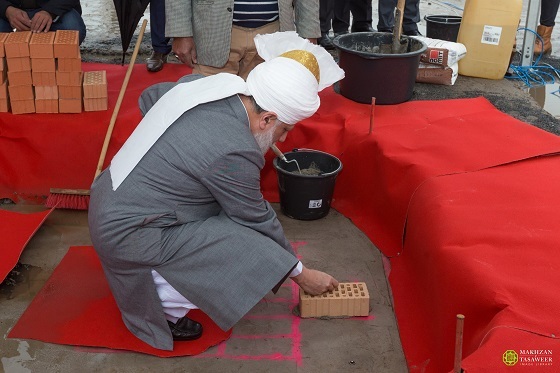 Following his address, Hazrat Mirza Masroor Ahmad laid the foundation stone for the Sadiq Mosque. Share the post "Foundation Stone for new Mosque laid by Head of Ahmadiyya Muslim Community"